Johan Cruyff: Why does Netherlands great matter? The last time he managed was 20 years ago. He last played in anger more than 30 years ago. Maybe the only time you have seen him is as part of a Fifa Ultimate Team. A punchy 94 overall rating by the way. 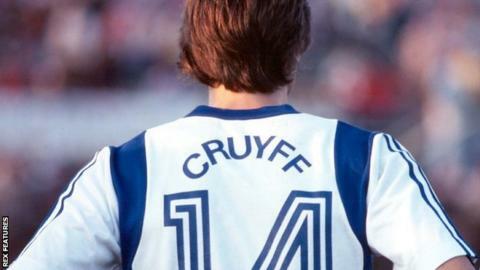 So why the fuss over Johan Cruyff? Before Cruyff, players used to just run straight into each other and hope for the best. But when the Dutchman left Sweden's Jan Olsson staggering like a closing-time drunk in the 1974 World Cup, no-one had seen anything like it. A dropped shoulder, a dummied pass, a flick off the instep, swivel and away. It makes little sense written down. But watch the video and you'll recognise it instantly. The 'Cruyff turn' is now a standard in every playground fancy-dan's box of tricks, and it all started with this man. An easy question. But there were no easy answers when you were part of the Netherlands' 1974 World Cup squad. The orange shirts would endlessly bomb forward, cover back, switch wings and swap positions, creating space and causing havoc. Stick with your man? Good luck with that. After winning everything going in the Netherlands with Ajax, Barcelona bought Cruyff for a then world record fee of £922,000. As a player, he won one La Liga title at the Nou Camp. He returned as a manager to win another four. And a European Cup. But his greatest legacy is not in the trophy cabinet. It is La Masia. Before Cruyff took charge, Barcelona's academy concentrated on strength and fitness. He put the ball at the centre of everything and the small-but-beautiful generation of Lionel Messi, Andres Iniesta and Xavi emerged. As Pep Guardiola said: "Johan Cruyff painted the chapel. Barcelona coaches since merely restore or improve it." Last month, a Barcelona penalty sent ripples through soccer, social media and the world at large. Instead of shooting at goal in the 6-1 win over Celta Viga, Messi cheekily rolled the ball sideways off the spot for team-mate Luis Suarez to smash home. A true original? Nope, another riff on the Cruyff playbook. Back in 1982, Cruyff and team-mate Jesper Olsen did the same for Ajax. But better. After controlling Cruyff's pass off the spot, Olsen drew the keeper and rolled it back for the original penalty-taker to slot into an empty net. Might Messi and Suarez have been paying tribute to Cruyff with their recreation? Before David Beckham aped Michael Jordan with number 23, before Mario Balotelli used 45 (4+5) as a shortcut to number nine, Johan Cruyff was the first superstar to stray from the usual one to 11 shirt numbers. The Dutchman took to wearing 14 for good luck after an Ajax win over rivals PSV Eindhoven. He was allowed to keep it on international duty when an alphabetical system would have seen him play in number one. In the wake of his death, financial traders paid tribute by placing orders for 14 shares in his former club Ajax. It rose 4% in value on the back of their purchases. And the shirt shenanigans didn't stop with Cruyff senior. With the Cruyff name weighing heavily, Johan's son Jordi, now sports director at Israeli club Maccabi Tel-Aviv, used his first name instead on his shirt. When he moved to Manchester United in 1996, he became one of the first players to be allowed to have something other than their surname across their shoulders in the Premier League.